What’s the Twack Record for Your Tweets? The growth of social media has added new layers of complexity to the promotional efforts at museums and historic sites. Along with mailing newsletters and event announcements and maintaining a website, we feel an increasing need to connect with our supporters through blogs, Twitter, Facebook, and LinkedIn. But is all this work having any impact? How can I better use these tools to engage my audiences? You may have noticed that I’ve been experimenting with Twitter this past year, adding a feed to the sidebar of my blog and sending out about three tweets each morning on news related to museums and historic sites using @maxvanbalgooy (@engagingplaces was already taken) and tagging them with #museum or #preservation. It’s nice to see the number of Followers grow and merit a Favorite or Retweet occasionally (thanks Bob! ), but what’s the impact? You may find some answers in the Followers dashboard that Twitter recently launched. 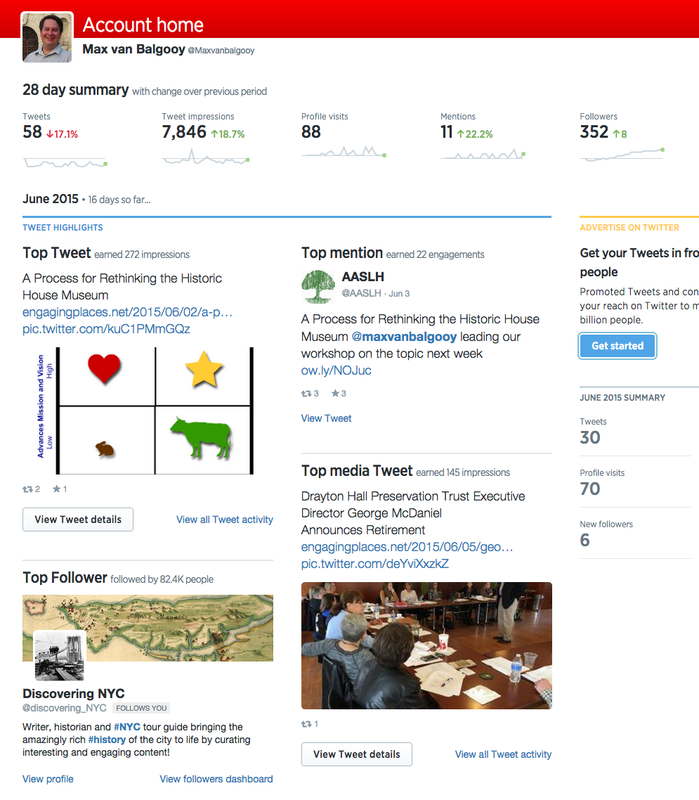 The dashboard provides several analytical tools that not only highlights activities for each month (e.g., the tweet that earned the most impressions, the tweet that was mentioned the most) but also provide a comparison to the previous month with charts so you can spot trends. Additional options can tell you more about your Followers (not surprising, my Followers’ top interest is books) and if the pool is sufficiently large, a breakdown by occupation, household income, and consumer lifestyle. Of course, Twitter is using these analytics to convince you to buy ads, but that’s optional and in the meantime the data is free. Perhaps you can use it to improve your tweeting track record. This entry was posted in Community engagement, Social media and tagged Twitter on June 17, 2015 by Max van Balgooy.